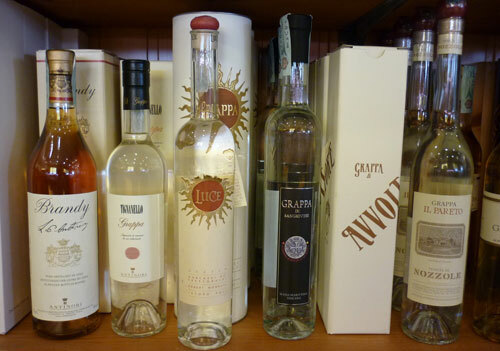 Looking for Italian grappa? Maremma is home to hundreds of Italian vineyards and wineries many of whom also produce their own distinctive grappa as well as some of the very best Italian wines. From herbal and fruity clear liquids to golden aged liquorice and reserva varieties, the choice is considerable. Enjoy browsing! The grappa bottles and labels themselves make for collectors pieces even if you don't like the liquer. Grappa - the distillate of grape pomace and grape residue remaining after the pressing of grapes during winemaking - has traditionally been drunk in Italy in one small shot after a meal as a "digestivo", to aid digestion. A uniquely Italian tradition and one that I still have difficulty in believing the truth of - my scientific education still has trouble finding the evidence to support this! - it nonetheless survives today with as much conviction as to its validity as when it was drunk centuries ago. Today it continues to be offered for the same purpose at the close of lunch or dinner, both in homes and restaurants, either added to the caffè - expresso, of course - as "un caffè corretto a grappa": literally meaning a corrected coffee. Or, more commonly for my family and friends, it is drunk as an "ammazzacaffè", either after the expresso in a shot glass, or as "resentin", directly added to the empty expresso cup, swirled and drunk in one go. You will also see it being drunk in bars as a "caffè corretto" with a morning coffee and brioche by men before they set off to work: a scene that still troubles me to this day when I witness it even if I understand the warming of the cockles principle on a cold winters day. What troubles me is that many of those men operate heavy machinery afterwards: grappa can be between 37.5% and 60% alcohol by volume (between 70 and 120 USA proof)!, although most of those produced are usually between 40 and 45 percent (80 - 90 proof). Enough said! Italy continues to surprise me every day. And with the development of aromatic, flavoured and aged "Riserva Invecchiata" grappa, what was once considered to be a "poor mans" distillate is becoming fashionable. Outside of Italy, Italian grappa can now be found in well-stocked bars and restaurants as amongst the choices for an after dinner liquer. Italian grappa is becoming fashionable. In alphabetical order by location of each Maremma vineyard and winery. Grappa di Arnione is steam distilled in copper vats and aged for 12 months in new French oak barrels (Troncais d'Allier). Grappa di Fattoria Casa di Terra: with a flavour and perfume of autumn in Tuscany. Grappa Riserva from Tarabuso wine pomace: aged for 18 months in barriques. 42% alcohol content. Grappa Bianca from Emilio primo wine pomace. 42% alcohol content. From the vineyards of the Azienda Agricola Montebelli (distilled in the north of Italy). Grappa della Pieve Vecchia. A fresh and soft grappa great with chocolate. Pagani de Marchi Grappa. A delicate fragrance of fruit and vanilla. 42% alcohol content. Grappa ColleMassari 80% Sangiovese 10% Ciliegiolo 10% Montepulciano. 42% alcohol content. Grappa Grattamacco 55% Cabernet Sauvignon 30% Merlot 15% Sangiovese. 42% alcohol content. Michele Satta Grappa IGT Toscana from the Sangiovese grape and produced by master distiller Joachim Nannoni. L'Addobbo Riserva Grappa di Sangiovese Montecucco. Aged for 18 months in barrique barrels. 42% alcohol. L'Addobbo Grappa di Sangiovese Montecucco. Aged for 18 months in barrique barrels. 42% alcohol. Grappa di Sangiovese Macchiaiolo. 42% vol. Grappa Brigantina. Marc of Sangiovese. 42% alcohol. Le Vigne Grappa from the distillate of fresh Sangiovese grape pumice, aged in small oak barrels for 12 months. Le Vigne Grappa Bianca. A dry grappa from the distillation of fresh Sangiovese grape pumice. Montesalario Grappa di Montecucco Sangiovese. A fruity grappa with a dry taste. Grappa di Montecucco Bianca 90% Sangiovese 10% Montepulciano. 42% alcohol. Grappa di montecucco Riserva 90% Sangiovese 10% Montepulciano. 42% alcohol. Perazzeta Grappa di Montecucco. 42% alcohol. Grappa di Montecucco Riserva. 42% alcohol. They also produce a brandy: Perazzeta Brandy Aquavite di Vino Invecchiata di Montecucco Sangiovese. 42% alcohol. Grappa di Sangiovese Montecucco. A young grappa with a bouquet of fresh fruit. Grappa del "Faurio". Made from Chardonnay grapes from the vineyards of Pitigliano. 40% alcohol. Perfect as a "digestivo" and with desserts. Grappa ColleMassari 80% Sangiovese 10% Ciliegiolo 10% Montepulciano. 42% alcohol. Grappa Cortilla aged in oak barrels. The Rasola Grappa Morellino. About 600 bottles are produced each year from the pomace of Morellino DOCG. Podere Il Casino Grappa from the distillation of marc/pomace. 42% alcohol.